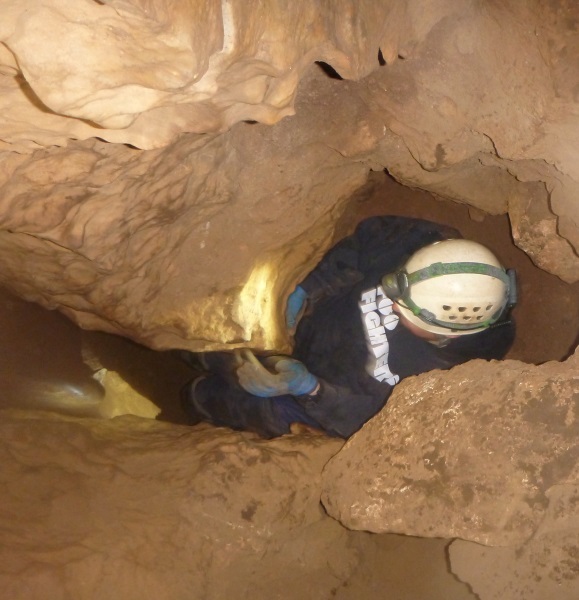 Bailey has wanted to go caving with me for some time now, so I booked David and Bailey on a MSS trip to Jenolan Caves. 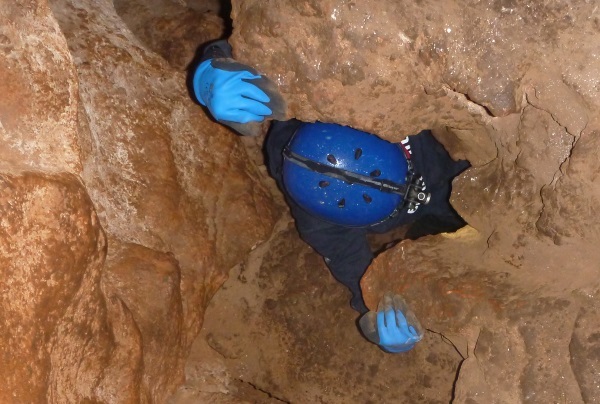 It’s always touch and go when you take people into their first wild cave, it’s nothing like a tourist cave! We arrived at the Caver’s Cottage around 9.30pm on Friday night, this would be their first culture shock. The Caver’s Cottage is an old, run-down former rangers cottage from the olden days. 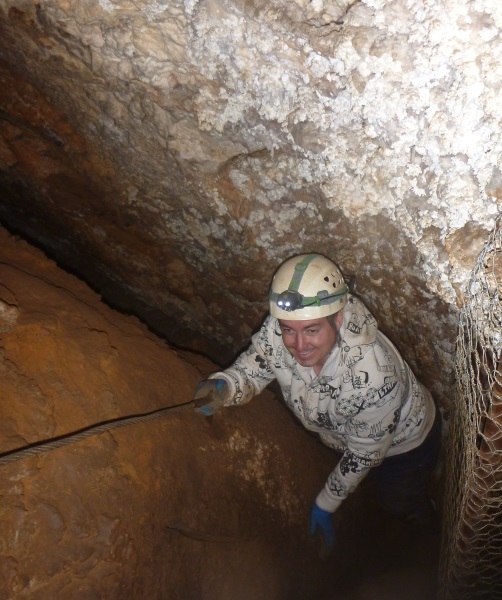 Jenolan Caves Trust allow cavers the use of it at a nominal price, of course we could have stayed at Caves House but I wanted David and Bailey to have an authentic caving experience, so the Cottage it was. We set ourselves up in The Shed which has some bunk beds in it, it’s not lined and is just a tin shed with a cement floor, fortunately it wasn’t cold. We were greeted on arrival by the resident possum who tried to climb up David’s leg and gave his pants a bite because we wouldn’t give him any food. Helena, Chris (the Leader) and their two children Ben and Owen were already there, so we said a quick hello, had a glass of wine with them and then headed off to bed. It was very warm in the shed. 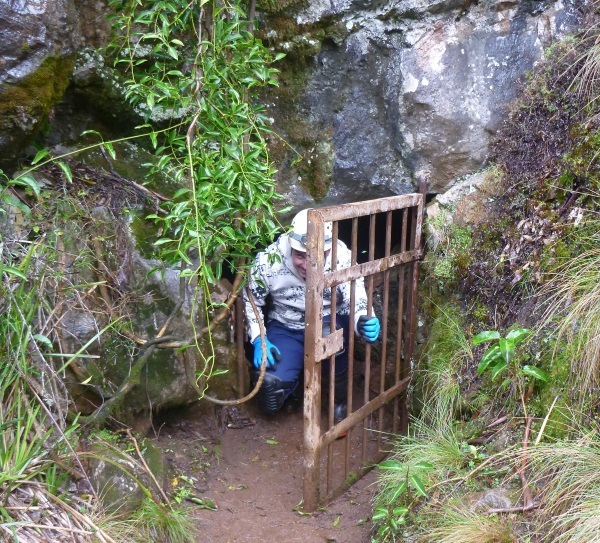 The gate (usually locked) and entry to the cave. Next morning we were all up bright and early and Jo, Ed and Paul arrived right on time, so we hopped in the cars and started down to the valley, parking the cars and then walking down the track to Aladdin. There was a little drizzle but nothing to worry about. 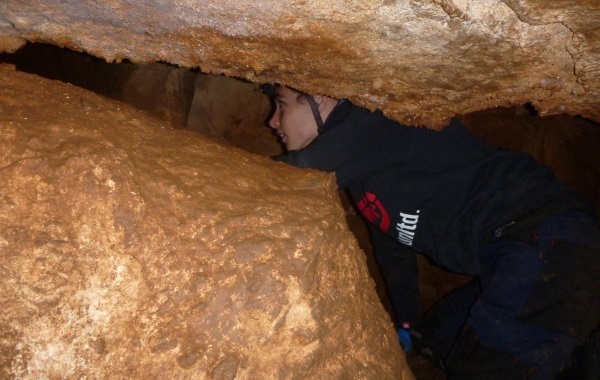 We arrived at the cave without any problem and had the right key to open the gate (which was good). The cave was originally a “tourist” cave so it’s not that daunting, although I find the traverse across some flow stone with nothing but a rope to stop you slipping down into a chasm to be a little off-putting, whenever I get to this spot I say “ah now I remember why I don’t like Aladdin!” David and Bailey managed it without any problems, this is followed by a ladder and then a large angled rock that you slide down, arriving at a small cavern where the cave branches off in three directions. 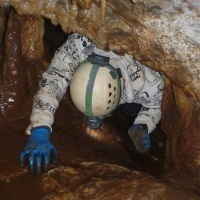 David exiting the hole that you have to crawl through to get to the first area of formations. 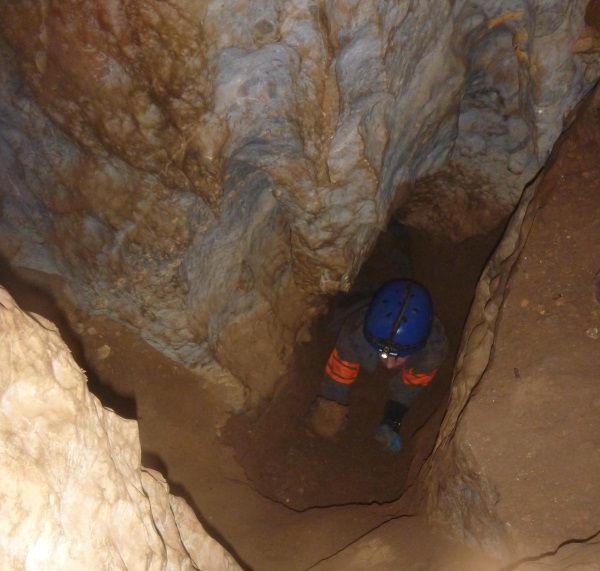 The first one we went into involves a bit of a squeeze through a hole (and a pool of water that your overalls soak up if you’re not careful), this takes you into a nice section with a lot of formations. Most of this section has steel posts with chicken wire to prevent people from accidentally breaking off the formations, and there is a section where you have to crawl through on elbows to get to another nice lot of formations. 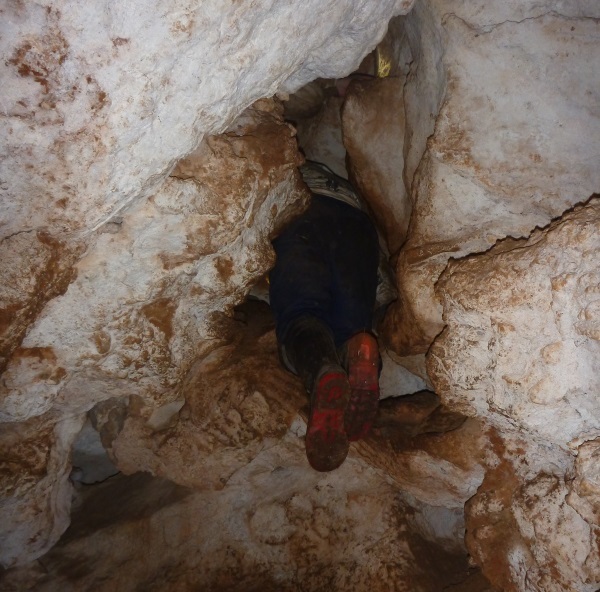 We then backtracked and climbed a ladder and stepped across on some really slippery limestone and climb up into two more areas with nice formations. I also say “ah yes I remember this step-across and I hate it too”), It is worthwhile climbing up to see the formations though, they are very pretty. Retracing our steps, I showed Chris the scene of my “slot of death” that Rod said I’d have no trouble getting back up (wrong), I was shattered by the time I got back to the top as there were no foot holds or hand holds, Rod literally pulled me out of the thing. We all had a look at it, but saved it for another day when we had more time (that would be never again for me). The next challenge was climbing up that slopey rock that we’d slid down (above), there is a rope to hold onto but it’s still walking on your knees. We had lunch on the bank outside before heading off for our second cave, Hennings. 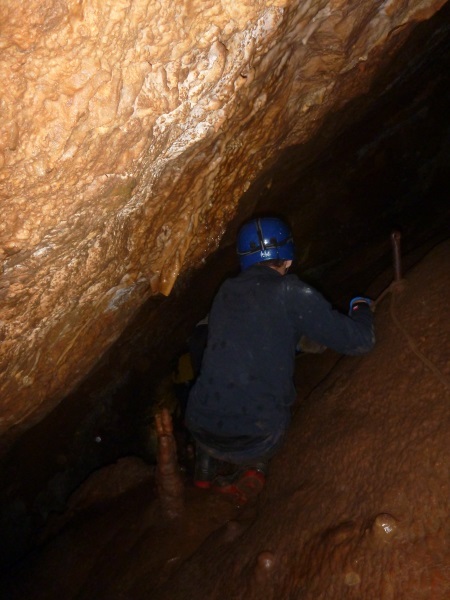 We had a bit of trouble finding Hennings, we’d gone too far up the valley, consequently we were running a little short of daylight hours, not that you need daylight in the cave, but it is nice to walk back to the cars in daylight. When we finally found it we realised that we’d walked right past it, and it was only 15m off the track. Bailey exiting a small crawl through, he did it just for the fun of it cause you could walk around it! I’d not been into Hennings before, but I’d go back again, there weren’t a great deal of nice formations, just a few sections, but the cave is a maze and we were flummoxed, we knew there was more but we didn’t know how to find it, so, I guess we’ll be going back there again. By the time we got back to the Cottage it was around 5.30 and we all had our “top showers” then settled in for happy hour. It was at this time that the possum showed up again and hung down from one of the doors to peek in at us. He was the source of much amusement for the rest of the evening and it was a race to close the door when you went outside to make sure he didn’t get inside! Helena cooked a wonderful lamb stew for dinner and after that most of the group played Settlers of Catan, but I’d had enough wine and food by then and was ready for an early night. It was drizzling lightly when we started out on Sunday morning heading up for Little Canyon Cave which would lead us “easily” into Serpentine, neither of which I’d been in before. It was only 1/2 an hours walk up the valley and the numerous cave entrances were very easy to find, but most of them were very small, half of us went through one squeeze and the rest went down a very sketch rock (slippery and almost vertical). Bailey exiting from where the dig was, this tunnel was dug out as a Project by MSS, only small people can go through, Chris made it but I didn’t think it was worth the effort, nothing to see on the other side! We made out way down a hole and into the cavern where MSS had done a “dig” about 12 months ago, Bailey, Owen, Ed and Chris went in to have a look but when Jo said it was too confining and there was nothing to see anyway, David and I decided just to watch the rest squirm through the tunnel and out again. Chris then went up a small climb and set up a rope. We watched him climb up the 20m pitch and then we heard him moving around up the top (lots of silence), by the time he reappeared he said it was very wet, and you had to slide along a tunnel – that was enough for Jo, David and me, the climb was going to be tough for me and I decided sliding through a tunnel with pools in it wasn’t worth the climb. I guess Chris’ comment, it’s squeezier than I remember also put us all off, so we retreated out of the cave and even that wasn’t easy, the holes seemed to have closed up a bit in the interim (just joking). It was now raining steadily so we were really wet when we got back to the cars. We packed up quickly, cleaned up the Cottage and then headed home. 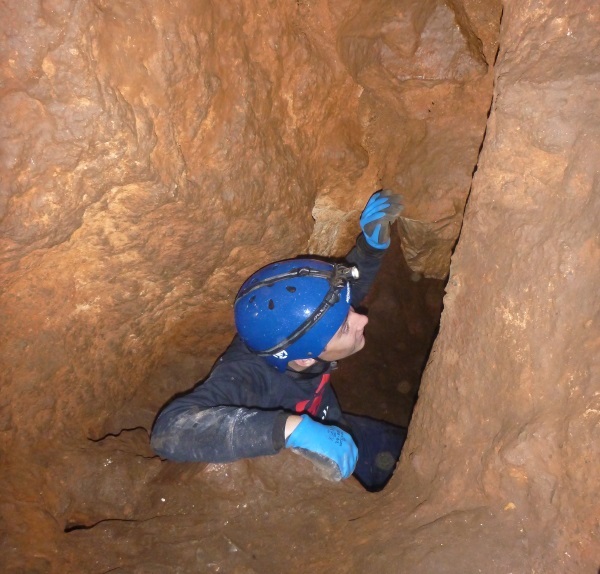 So, did David and Bailey enjoy caving – Bailey is a definite yes, he really liked it, didn’t mind the squeezes and mud and the adventure of it got him in. David enjoyed Aladdin and Hennings because he liked getting to see the formations but he wasn’t at all keen on Little Canyon Cave, so I’ll have to bear that in mind for the future. It was great to have David and Bailey out on an adventure with me! 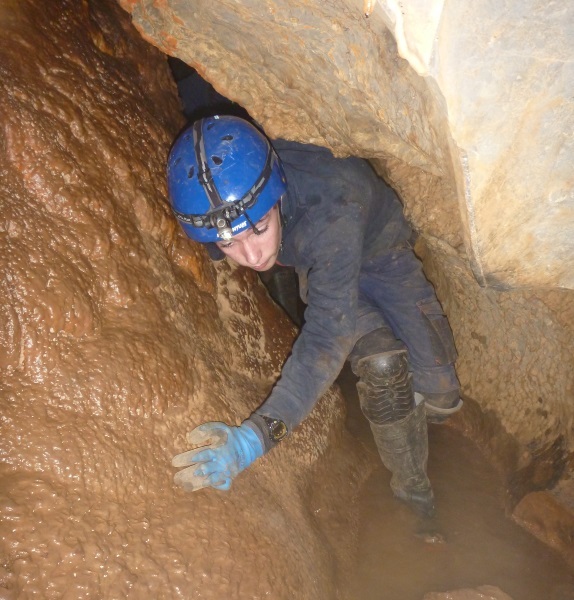 This entry was posted in Caving, Family, MSS. Bookmark the permalink. Sounded like a pretty exhausting couple of days with squeezes, slippery rocks, mud and water. A nice adventure for the weekend. 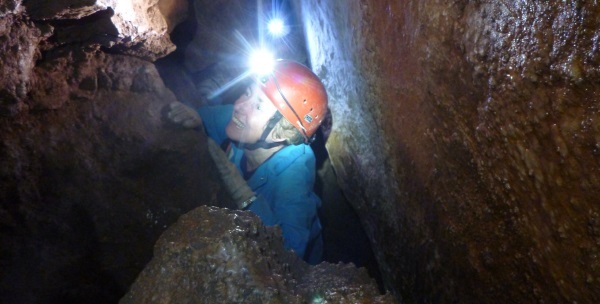 Have you been in any caves that have large cavern or are they the tourist ones? Yes, they slept well on Saturday night, had to wake them up at 8.30 on Sunday! 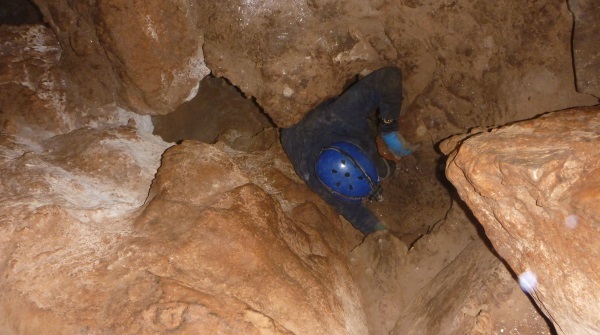 Depends on what you mean by large caverns, some of the caverns we went into were about the size of a small caravan, others were that size horizontally but 2 stories high vertically. 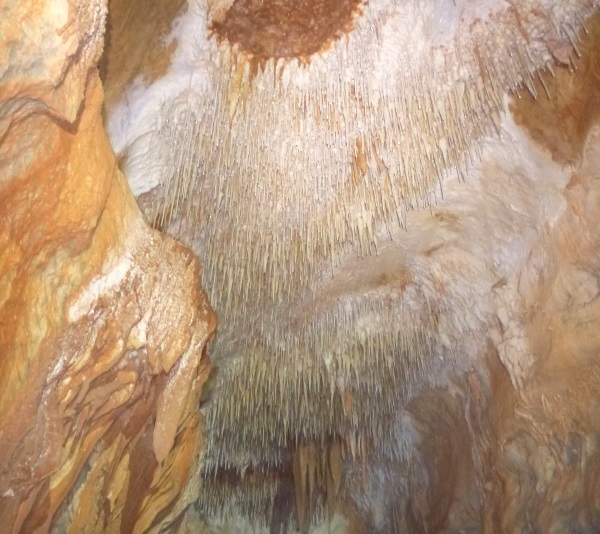 These particular caves all had smallish caverns but some of the others at Jenolan, like Mammoth, have larger caverns, the really big ones are the tourist caves. These photos are great!! I must admit I am feeling a little claustrophobic looking at them. Glad everyone had a great weekend ? 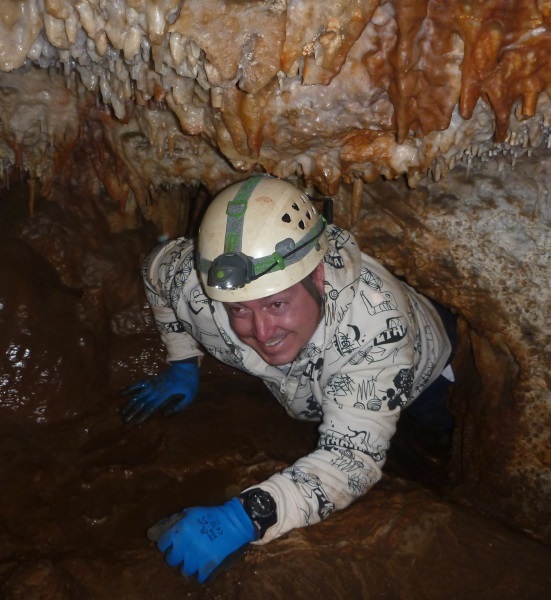 Ah, but you went in the Jenolan Tourist caves! Don’t think you’d like any of the ones we went down, but maybe can take you into a BIG one another time. Yes, Possum is cute, although we gave it a piece of banana and it dropped it and when I tried to give it back his claw scratched me, having got any signs of rabies yet! I will share the album on FB so the rellies can see them. Wow these look great. I am so glad you didn’t find the rest of Hennings…. you love to go back for a challenge! I didn’t know the things from the ceiling were called straws. Are they the same as stalic tights, but a caving term, or are they different again? Ah, you know me so well. 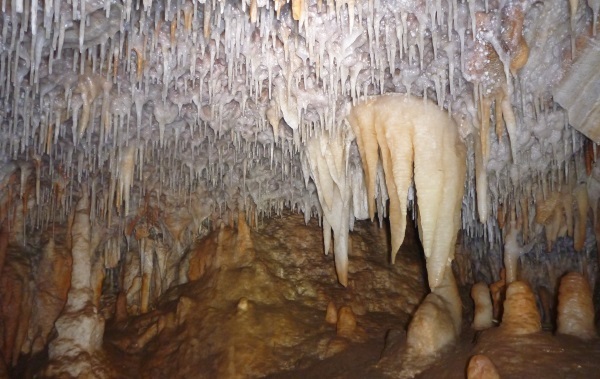 The straw (aka tubular stalactites) is a hollow tube that can turn into a stalactite if the hole at the bottom is blocked or if the water begins flowing on the outside of the hollow tube. 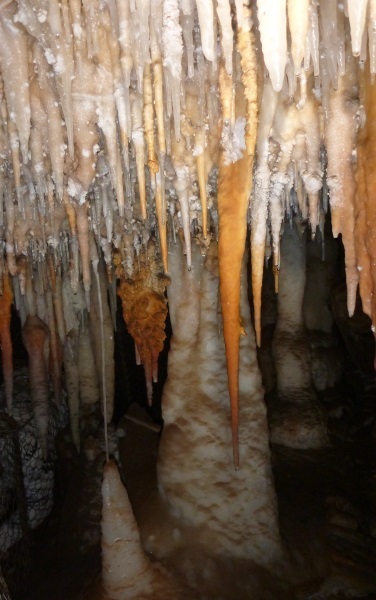 I saw a stalactite that had broken off when I was down at Yarrangobilly and you could see the hollow tube through the middle of it, fascinating. These straws apparently can grow up to 9m long! Great that David and Bailey could share in this adventure. Love you resident opossum! Yes, it’s not often that they’re free to join me. 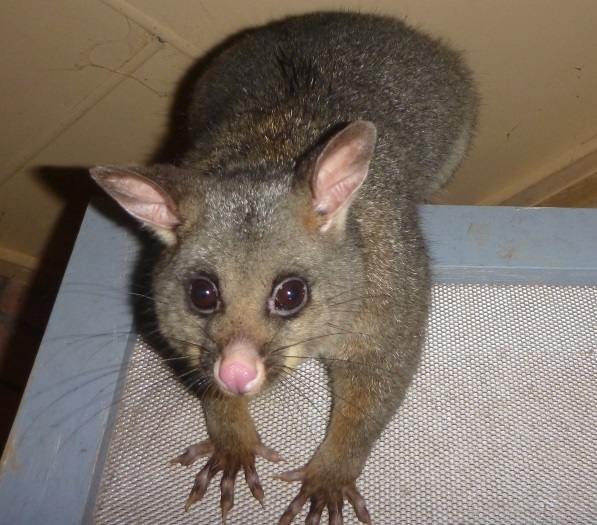 Possum was cute, obviously other cavers had fed him often as he was not backward in coming forward to be fed!